I do not claim to be an expert in any area. Set of Six (6). Beautiful previously owned condition. Slight, if any marks as they appear to have never been used. • Unmarked Crystal Wine Glasses. 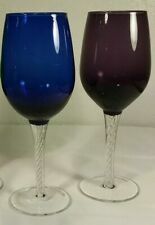 Air Twist Stem Colored Wine Glasses Cobalt Blue & Purple 8 3/4"
Beautiful Air Twist Stem Colored Wine Glasses. In Excellent condition. Colors are Cobalt Blue & Purple. No Worries! HI, THIS IS FOR 2 COBALT BLUE CRYSTAL WINE GLASSES. I do not claim to be an expert in any area. Set of Three (3). Beautiful previously owned condition. Do not appear to have ever been used. Anna Hutte Bleikristall. Cobalt Blue & clear glass. Wine Goblets. In addition. 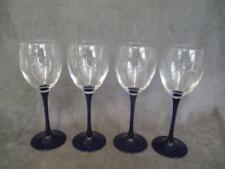 8 Crystal Wine Glasses With Cobalt Blue Stems And Gold Trim Lot of 8. Glasses are in excellent condition some of the gold rim has wear Shipped with USPS Priority Mail. These beautiful glasses are unmarked so their origin is unknown, but they bear a strong resemblance to Romanian mosaic glass design. Price is for the pair. Set of 4 Rosenthal Linear Terzo Cobalt Footed Crystal White Wine Glasses 5 7/8"
Estate found, excellent condition. Each approx. 5 7/8" in height. COBALT STEM. 4 WINE / WATER GLASSES. 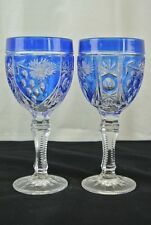 Your looking to buy 2 Lenox blue stem goblets. These 8 1/8" tall goblets have gold edges. They have drape design glass sides. ARTESIA BLUE WINE GLASSES. PATTERN: ARTESIA BLUE BY BLOCK. Please scroll down to bottom of listing for complete description and to see all pictures. Pictures are considered part of description so please enlarge to see best detail, thank you Hello, for your consideration is beautiful water/wine glass goblet with rich cobalt color and wonderful design etched under gold Details: Made by SC Line Made in Italy Label on bottom Made of crystal Gold gilt finish Etched design Measures 7 3/8" high Condition: Good color and shine with very little wear ~ No chips or cracks ~ Label still attached ~ There is a thin groove line on stem from when crafted, picture 8 Thank you for looking, God Bless you and have a beautiful day!. (This is considered a water glass since it is taller than the wine glass.). There are many variations in hand cut crystal. This includes, but is not limited to, size, weight, air bubbles and variations in color. Stunning Towle Silversmiths cobalt blue wine glass. Original stickers still in place on the base. Perfect in every way! This glass is 7-1/2" in height. Case Cut to Clear Cobalt Blue Decanter. There is a small chip on the stopper (see pic). There is a silver colored label that I am unable to read. THERE IS A SMALL CHIP ON THE INSIDE of the glass AS SHOWN. You do not feel the chip from the outside or top rim. FANTASTIC COLOR AND FEEL. If by chance you have any issues with your item. Not altered or broken, not worn no odors. RARE set 8 Cristal de Sevres Crystal cobalt blue Stem champagne Wine Goblet 9"
GORGEOUS SET OF HAND BLOWN SEVRES CRYSTAL. with clear bowls and magnificentart crystal cobalt blue bases. marilyn barfoot. BROUGHT TO YOU BY. Beautiful Air Twist Stem Colored Wine Glass(es). In Excellent condition. Colors are Cobalt Blue, Purple and Green. No Worries! GORGEOUS SET OF HAND BLOWN SEVRES CRYSTAL. with clear bowls and magnificentart crystal cobalt blue bases. 8 glasses each signed individually by the artist on the bases. Beautiful long stem cobalt blue twisted glasses, very rare. CourVoiser 6 oz Crystal Wine Goblet Stemware Glass Cobalt Tear Drop Stem 6.5"
Up for sale is three Luminarc W ine Champagne Toasting Flutes Domino Black Stems Foot Glass 8.5” Tall 5oz Made in France Very nice flutes no issues great color. Up for Your Consideration is a StunningCobalt Blue Stem CRISTAL DE SEVRES Wine Goblet. Cristal Clear Glass with an Intricate Cobalt Blue Stem. Cristal Sevres France. Base is 3". Etched on Bottom. We will try to resolve any issues right away. 8 1/8" tall x 1 3/4" across top rim. The pattern has an elegant shape and features a clear cut pattern on the bowl of the glass and clear stem.The glass is in excellent condition with no signs of use. The cobalt blue color is bright and vivid. This item is 6 3/4" high. We only have a few glasses left to complete your collection. I do not claim to be an expert in any area. Beautiful previously owned condition. Does not appear to have ever been used. Set of Three (3).